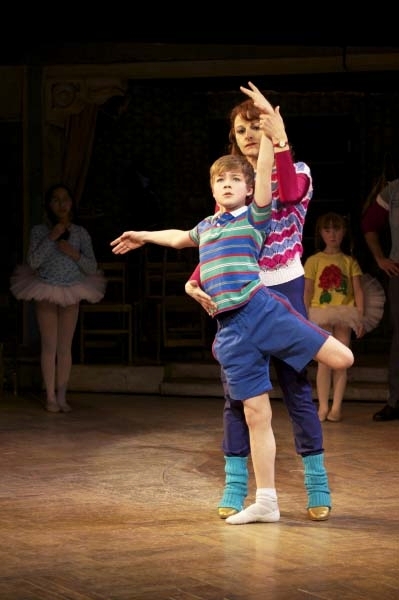 Scottish dance sensation Harris Beattie is currently starring as the young Billy in the London West End production of Billy Elliott The Musical, at the Victoria Palace Theatre. Harris has been an active member of the Royal Academy of Dance (RAD) since 2007: in 2010 he won the 2010 Genée Dance Challenge in Birmingham with his solo The Enchantment, choreographed by Karen Berry. Later that year, Beattie performed the same winning solo at the exclusive Supper with the Stars gala dinner, held to raise funds for the Genée International Ballet Competition 2010 in London, in front of dance stars Chris Hollins and The Royal Ballet’s Sarah Lamb, Tamara Rojo and Steven McRae. Harris was also one of the 18 students from dance schools across the UK, chosen to demonstrate a range of exercises from the RAD’s new Grades 1-3 Syllabi in front of over 500 delegates at the Mermaid Conference & Events Centre in London on 3 January 2012. It’s a struggle to get boys to dance, but a workshop in Birmingham set out to change that. With his proud father roaring encouragement from the sidelines, a stocky lad bounds past, wearing an England rugby top. Then he joins the rest of the boys for a strenuous, sweaty work-out. But there is no fierce scrum in the mud. No ruck. No ripping of ear lobes or wrenching of hair. Not once is an oval ball booted into touch. Rugby isn’t the game being played here today. Instead, it is an all-boy ballet session, with pirouettes and pliés instead of punch-ups on the line-out. Forty-eight budding Billy Elliots from around the country gathered at DanceXchange, based in Birmingham’s Hippodrome, to participate in the Boys Only Workshop, a rare opportunity for them to practise and perform with their male peers. Billy Elliot may have been a huge hit, both as a film and stage musical, but it remains a struggle getting British boys involved in dance. Which is why the Royal Academy of Dance subsidised a three-day workshop, using funds raised by a gala performance of Billy Elliot. It is the first time many of the eight to 16-year-olds have been taught dance by men; the first time they won’t have to be the odd-one-out in predominantly female dance classes. Gareth is one of the tutors at the Elmhurst School for Dance, Edgbaston. 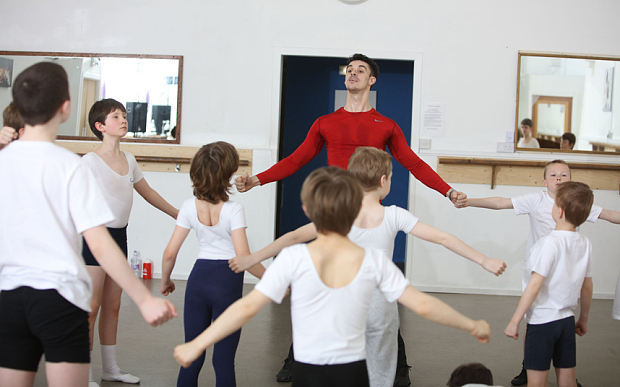 “Because I teach at a dance school, I get a high number of boys in my classes,” he says. “On this course, most of the boys go to ordinary schools. So they will maybe have a ballet class once a week in a draughty church hall, where there will be very few other boys involved. That can be off-putting. “And, of course, boys can be bullied when they show an interest in dance. Gareth adds: “It is also important that we have had an intensive three days working with these boys. The students at the Boys Only Workshop may still be wearing their L-plates. But during their final-day performance in front of parents, it is clear that they are all anxious to stamp down hard on the dance accelerator and shift into top gear. The rugby-top lad, and all the other smooth-movers, do their thing with great aplomb.To the delicate tickle and trickle of piano keys, they shape their arms into elegant Grecian urns; then it is up on the toes and leaping through the air. Through it all, they exhibit posture, poise, poetry of movement. However, posture, poise and poetry of movement are all dumped, for one nanosecond, by a lively youngster flashing his dad a cheeky wink. Which is acceptable – these are boys, after all. Parents are then treated to a fine display of Indian dance, which whets the appetite for a scene from Swan Lake. Jack Brownhill, a 13-year-old from Willenhall, is one of the best of the bunch. He comes from an ordinary background and his prison officer mother grins while watching him go through his immaculate moves. But, of course, hard work isn’t the only hurdle that has to be jumped. There is also the scorn of other youngsters, who often dismiss dance with sneers and snarls.Luckily that has not been too much of a problem for Jack, who is not the kind of child easily bullied by the mob.“I do kick-boxing as well,” he smiles. “So that stops anyone at school trying to have a go. A COUPLE of Evesham boys have proved ballet is not just for girls by competing in an all-boys dance event at the Hippodrome in Birmingham. 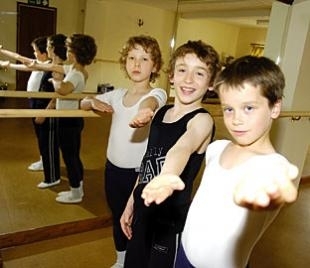 Oliver Gould, Charlie Watson and Jack Dempsey, who all go to the Jacqueline School of Dance, in Willersey, took part in ballet, contemporary and South Asian Kathak classes which culminated in a short performance in the Birmingham Royal Ballet’s studios. The event was spearheaded by the Royal Academy of Dance who, following the success of the musical Billy Elliot, wanted to build on the renaissance ballet and other dance forms found with a new generation of young male dancers. Ballet teacher, Louise Gould, from Evesham, said: “The trio were part of a 50-strong group of boys from dance schools all over the country. “The teachers were ex-professionals, and it was an opportunity to get some top quality lessons with the aim of promoting dance particularly for boys.